Electricity drives our economy and forms the basis of our society. The Energiewende confronts the system with major challenges: Electricity from renewable sources is low-emission, but it is not continuously available. Solutions are being developed for this purpose. LEAG is embarking on a new course and will build a 50-Megawatt (MW) battery storage system at the Schwarze Pump power plant and industrial park. BigBattery Lausitz combines modern power plant infrastructures with storage technology in a completely new order of magnitude. In this constellation the project is the only one of its kind in Europe, to date. The storage facility, which is based on lithium-ion technology, will make power generation more flexible and help protect the power grid from fluctuations. BigBattery Lausitz is characterised by innovative charging management and the use of a new type of power plant control system. LEAG is thus contributing another important factor to the system integration of renewable resources. The BigBattery will be built next to the Schwarze Pumpe power plant. An area of 120 by 44 metres will be used to accommodate 13 containers containing lithium-ion batteries with a capacity of around 53 megawatt hours (MWh). The battery storage system will be connected to the grid at the high-voltage level (110 kilovolts). The connection to the extra-high voltage grid is also provided here. Construction work is scheduled to start in early summer 2019 and the commercial commissioning in summer 2020. The investment is estimated to be approximately 25 million euros. The main contractor for the construction is the Czech energy company EGEM, which intends to cooperate with regional service providers from Lusatia. The project is subsidised by the state of Brandenburg. The storage facility will store electricity produced in the Schwarze Pumpe power plant and electricity from the grid, which is made up of various energy sources. 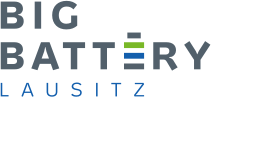 The loading and unloading of BigBattery Lausitz will be based on the prevailing conditions in the electricity grid and the electricity markets. Generation, consumption and storage are all interlinked in an intelligent way. In combination, various system services, such as balancing energy for the electricity market, can then be made available. The objective is also to develop further applications for stabilising the supply security derived from storage management experience. Balancing energy is the safety buffer of the German electricity grid. Power generation and consumption must always be kept in equilibrium, otherwise supply disruptions and in the worst case a nationwide power failure, known as a Blackout will occur. In order to prevent this, the transmission system operators have various types of what is termed balancing energy: They differ, among other things, in the availability time and reaction speed. Thus, primary control energy must be available within 30 seconds. Secondary control energy follows within five minutes and tertiary control energy within 15 minutes. Their use ensures stable grid operation even in the event of any unforeseen fluctuations in electricity generation or consumption. Most of this operation reserve today comes from conventional power plants, since it must be available absolutely reliably regardless of wind and sun. Here alternative solutions are needed in the course of the Energiewende. A key technology is electricity storage. With BigBattery Lausitz, LEAG will build and operate one of the largest battery storage systems of its kind.